The following excerpts are from Art: A History of Painting, Sculpture, and Architecture by Frederick Hartt (Prentice-Hall, Inc., 1976). The sculptor Aristide Maillol (1861-1944) had been for a while a painter allied to the Nabis [a post-Impressionist group of artists centered around Paul Gauguin--the word means "prophet" in Hebrew]. 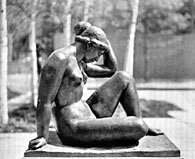 Not until a dangerous eye disease forced him to renounce painting did Maillol commence his career as a sculptor. His Mediterranean, of about 1901, then known simply as Crouching Woman, was exhibited at the Salon d'Automne of 1905, renowned for the "Fauve Art" scandal. [The sculptor] Rodin had greatly admired a slightly later work of Maillol in much the same style, saying that he knew of nothing "so absolutely beautiful, absolutely pure, absolutely a masterpiece . . . in all modern sculpture." This comment is the less expected in that Maillol's style seems in every respect opposed to that of Rodin. The transformation Maillol brought about is as sudden and as far-reaching as that between the Rococo and David, but without any hint of political motivation. The accidentality, immediacy, and strong emotion of Rodin are replaced in Maillol's statue with the revived classical values of balance, repose, and restraint. The simple masses of the figure recall the nobility of the Severe Style in the sculpture of fifth-century Greece and even the simple grandeur of that of Old Kingdom Egypt, which Maillol had admired with Gauguin in the Louvre. 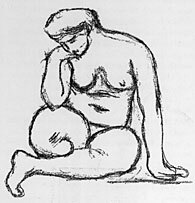 The quiet, understated forms of the body, the limbs, and the head of Maillol's reposeful figure reveal to a great degree than had Cézanne's own paintings the cylinder, the cone, and the sphere that the great leader of Post-Impressionism sought in the natural world. Although Maillol occasionally experimented with more dynamic poses and dramatic contrasts of direction, in general he was content to the end of his long life to continue in much the same vein as this early work. He often reused an earlier figure, or removed head and limbs to reduce it to a torso fragment, thus imitating deliberately the effect produced by time and accident on works of ancient art.